A number of MacBook and MacBook Pro models are showing up in Apple's online store as sold out but available for delivery after June 4, suggesting that a refresh of some lines could be announced during June's WWDC event. 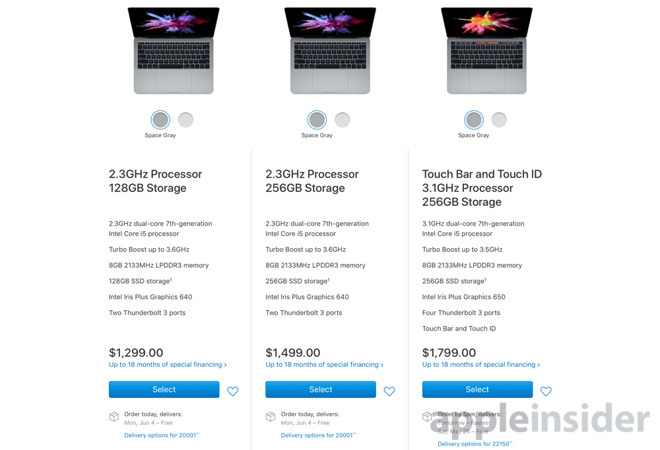 Attempts to order a MacBook equipped with a Core i7 processor through the online Apple Store in the U.S. reveals there is no more stock of that model available to buy immediately for delivery, AppleInsider has discovered. While the models can still be ordered, it is noted the free delivery option period starts from June 4 and runs until June 6. In some cases, it is also not possible to get the Core i7 MacBook models via an in-store pickup until June 6. A search for the Core i7 MacBook model in the United Kingdom has similar availability issues, with shipments between June 5 and June 7 available, but not arriving any earlier. A browse of the MacBook Pro range indicates the 13-inch models equipped with a 2.3GHz Core i5 processor only have shipments available from June 4, with local delivery varying. Other models of MacBook, MacBook Air, and MacBook Pro are able to be bought with normal earlier delivery estimates. The lack of availability of models in the online Apple Store, as well as low stock in some stores, could be interpreted as an indication Apple is making changes to its stock levels ahead of a product line refresh or introduction of a new model. As the WWDC 2018 keynote is taking place on June 4, the timing of the shipments coinciding with the developer conference strongly suggests the MacBooks in question will be the subject of some announcement at the event. Apple has been rumored to have new MacBook Pro models ready for WWDC with Intel's Coffee Lake processor. However, the Cannon Lake processors allowing the unit to have 32GB of LPDDR4 RAM without switching to DDR4 RAM likely won't ship until late in 2018 and possibly early 2019.